Because I work for the federal government, both recreational and medical use of marijuana is still prohibited, and we do have random urine drug screenings, sometimes several times a year. I’m not worried at all, however, as the only smoking I do is with food, including various proteins, carbohydrates and even fat. Though my latest contraption is on a smaller scale. Namely to smoke various raw seafood and cocktails. It’s basically a handheld smoking gun that’s powered by two AA batteries. The smoke is pumped into a sealed box or pan or under a glass cloche and left to sit for a minute or so to give the seafood or cocktail a light “kiss” of smoke. And because it’s only about the size of a medium flashlight, you can also bring it to parties over the holidays to wow the host with your mixology skills. No, I’m not suggesting that you order food from a restaurant to be delivered to your host’s home. In fact, I don’t even endorse having it delivered to your home, even if you’re the host. If you do purchase food from a restaurant to serve to your guests, at least “doll” it up a little to make it appear as though you put some effort into feeding your guests. What I am endorsing is transport systems that take your culinary creation from point A to point B that keeps cold foods cold and hot foods hot. You can find various insulated food carriers that can transport up to two 13” x 9” pans to your destination, keeping your creation hot or at the very least, very warm. Some also include gel packs that can be microwaved for additional heating capacity. These same insulated carriers can also transport cold food items, keeping them chilled, and if they include the gel packs, the packs can be frozen for prolonged cooling capacity. At our recent workplace Thanksgiving potluck lunch, the Mrs. suggested I make my Asian Sweet Rice Dressing, which basically is sweet rice cooked with bamboo shoots, rehydrated shiitake, water chestnuts, chestnuts and lup cheong with some oyster sauce, shoyu and five spice powder. I did all of my chopping the night before and pre-soaked the sweet rice overnight, so all I had to do was mix everything together, place it in my trusty Tiger MiCom multicooker and hit the start button. Of course, since we normally leave the house at about 5:45 a.m. and the first lunch doesn’t start until 11 a.m., lasting until 2:30 p.m., the rice dressing would be sitting at room temperature for a little over five to almost nine hours. That’s potentially a lot of time sitting in the “danger zone.” The “danger zone” is between 40 degrees Fahrenheit, which is just above refrigerator temperature, to 140 degrees Fahrenheit, which is the maximum temperature most water heaters can be set to. As a rule of thumb, food should not remain in the danger zone for more than four hours. Some public health nutritionists actually set a tighter danger zone for just two hours, so while my rice dressing might not pose a culinary risk for the first set of luncher’s, those who start lunch after noon are playing culinary roulette. Of course, I could simply leave the rice dressing in the cooker and set it to warm, but my workplace lunch room isn’t equipped with very many electrical outlets. Thus, I simply transferred my rice dressing to my Tiger Thermal Magic Cooker, which is simply a stainless-steel cooking vessel placed inside of a dual walled, vacuum sealed outer container that keeps food very hot for extended periods as the vacuum sealed outer chamber reduces heat loss to a minimum. And with that, my Asian Sweet Rice Dressing remained hot until the last of my co-workers had lunch. Most of all, entertaining, whether you’re the host or the guest should be fun. You shouldn’t have to stress over your culinary creation, as the holidays are mainly about people, whether it’s connecting (or re-connecting) with acquaintances, with food and drink being secondary. Of course, if you feel you have to roast that perfect A5 Wagyu rib roast served with the perfect black truffle infused Périgueux sauce or that perfect Duck a l’Orange, then you’re self-inflicting your own holiday stress. And I’ve learned that even if you pull off culinary perfection, some diners may not prefer their beef medium-rare or well done. Some may not like raw seafood, some avoid all seafood and in my own personal world, I have two good friends who have very severe shellfish allergies. For starters, in the 50th, raw seafood always has a place on anyone’s tablet, whether it’s sashimi or poké. And while most poké is purchased, it also is simple to prepare and can be made well before you leave the house or the guests arrive. For sashimi, I simply adorn the bottom of the serving plate with either finely julienned cabbage or daikon “strings” sliced from a mandolin. They help to maintain the moisture level of the sliced fish, and once it’s plated, I wrap the dish with cellophane to maintain the moisture in the sliced fish. Salad courses also keep the stress level low, as most of the ingredients can be prepared well before party time, including salad Niçoise, panzanella or whole grain salads. They simply need to be transported in a cool travel vessel (soft sided cooler) or kept in the refrigerator prior to service (if you’re the host). Finally, for proteins, I favor braising poultry, pork or beef as the timing between dish completion and service isn’t critical at all. I can also easily transport braised dishes in my Tiger Thermal Magic Cooker. Sometimes I simply leave it in the cooking vessel, especially if it’s cast iron, as cast iron Dutch ovens maintain heat quite nicely and Le Creuset and Staub also make decorative tomato and pumpkin shaped cooking vessels. We do have several acquaintances who don’t cook, nor do they pretend to be cooks. In this case, a nice hostess gift, floral arrangement or bottle of Champagne is welcome at most households. 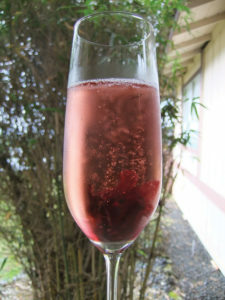 Especially Champagne, but if you feel the pocket pinch for the real McCoy, simply purchase any domestic Rosé sparkler for this cocktail I first highlighted about three years ago in The Hawaii Herald. The inspiration for this cocktail comes from the French 75, which combines two of my favorite libations, Champagne and gin. Though this libation contains no gin, I created my Hawai‘i twist to the French 75 and wanted to originally call it the Hawaii 5-0, but I’m pretty sure that the name is copyrighted, so since my cocktail has two Hawai‘i-based libations, Kai vodka and Lokelani Rosé sparkling wine and it’s garnished with the state flower, I call it the Hawaii 2.5. Point five because the Wild Hibiscus Flowers in Syrup is actually made Down Under. Mix the ginger and lychee liqueurs and the vodka then pour one ounce of the mixture into Champagne flutes. 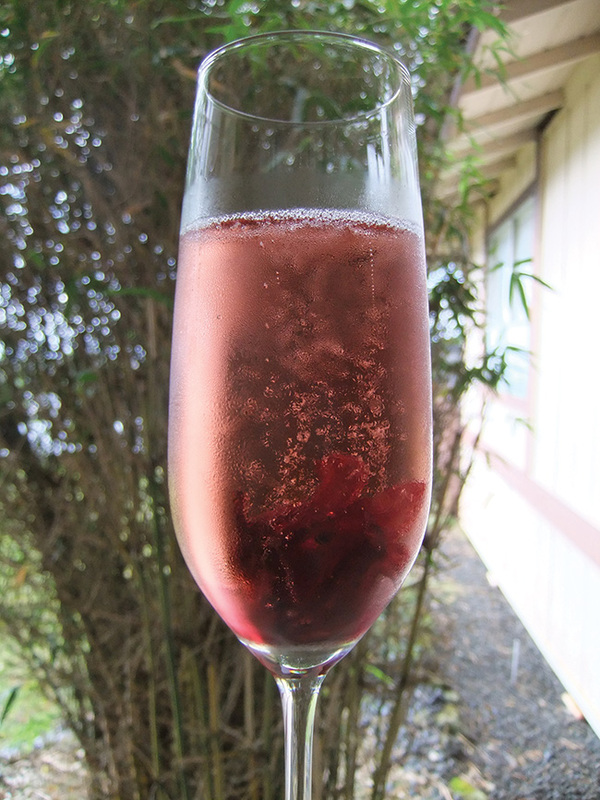 Place one hibiscus flower in the flute and top off with four ounces of Lokelani Rosé sparkling wine.